How heavy is a concrete laundry tub? Although all of the water pipes on our property are copper, the hot and cold water pipes to this laundry tub are galvanized. I think what happened is when my Dad built our laundry room addition 30 years ago, he used galvanized pipes since that's what he had on hand. Anyway, the cold water galvanized pipe right behind the faucet developed a leak due to corrosion. I need to move the laundry tub to open up the double wall to replace the galvanized pipes with copper pipes. Any retired plumber out there that knows about how much a single compartment concrete laundry tub weighs? More than 70, less than 200. I moved one that felt ~150 the other day, but it was a double. So probably under 100, anyway. Measure it. Google Concrete weight calculator. If its 32" x 30" x 24" tall on the outside, with 2" thick walls, its 7000 cubic inches and weighs 575 pounds. With a length of 2x4 lumber and bath scales you can weigh it. I didn't do any math but there's no way that the sink pictured weighs even close to 575 lbs. Last edited by kwikfishron; 12-03-2014 at 07:54 PM. Some of those old sinks are actually soap stone. 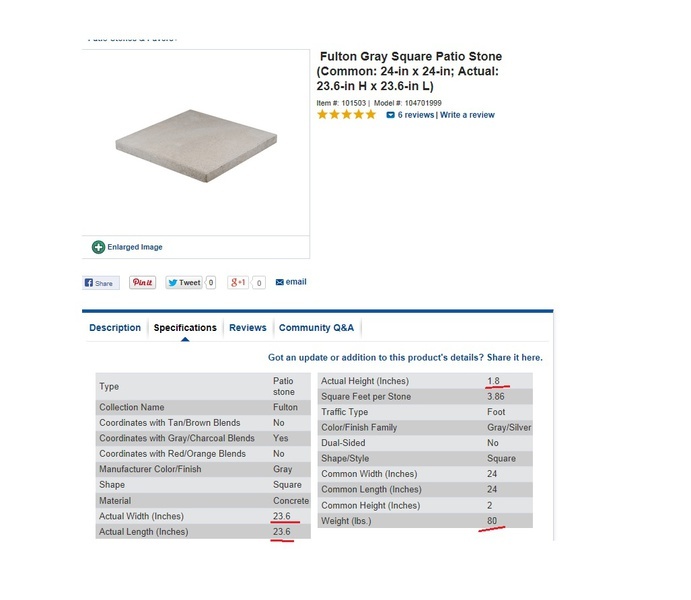 Google says around 20 lb/sq ft.
My concern is the flimsy legs. Don't let them fold up on you!! Not too many bath scales will go that high, I'm betting. Probably closer to 300# than 200... had one similar to that, was 1.5 inch thick... I moved it, but I couldn't get it up into the pickup without help. Something wrong in what you googled. Weight should be per cubic foot, not per square foot. 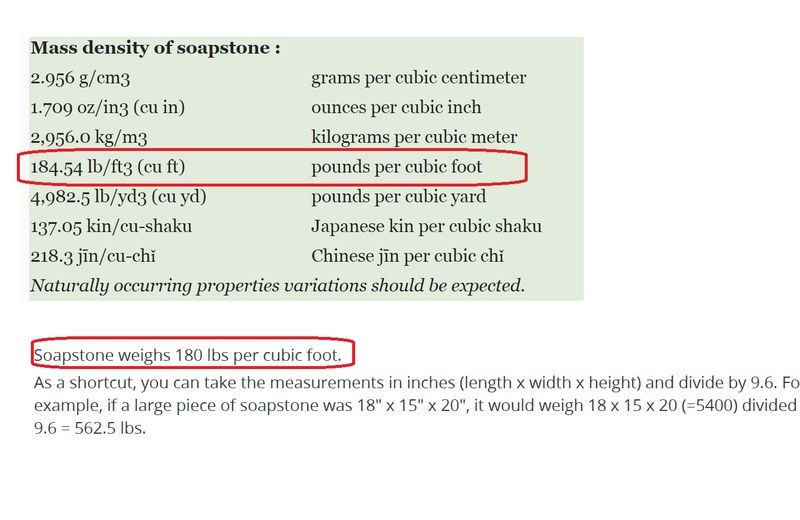 Soapstone seems to be heavier than concrete. The one in my parent's old house is a double with walls about 3" thick. It aint going anywhere. Last edited by SPS-1; 12-03-2014 at 08:47 PM. Dang! That's a lot of kin per cubic shaku! SPS-1 came up with a good idea about using an online concrete calculator that I didn't think of doing. Measuring the 4 walls and assuming that the bottom is also 1.2 inches thick like the walls, using an online concrete calculator I came up with 134.8 lbs. Oh and thank you TheEplumber for the warning about the legs folding up on me. The legs are old and a little rusty so I can see that happening. I would have overlooked it without your warning. Last edited by Homerepairguy; 12-04-2014 at 01:18 AM. I've come up with an idea for moving the laundry tub that I'd like to run by you guys. The tub's drain goes into a trap and then the pipe runs horizontally into the double wall. It's made out of black ABS. I might have to use additional lumber on top of the jack to attain the height needed if the jack cannot go up high enough. Then lower the tub all the way down and use the automotive floor jack to move it since the jack has wheels. When reinstalling the tub, jack it back up and install a new leg assembly made out of an old bed frame. I think I can assemble the bed frame leg assembly by bolting it together. I'll use stainless steel bolts. Then lower the tub on the new bed frame legs.